Damn i keep missing this. Well I'll be out there for sure on monday. Well I was out there. 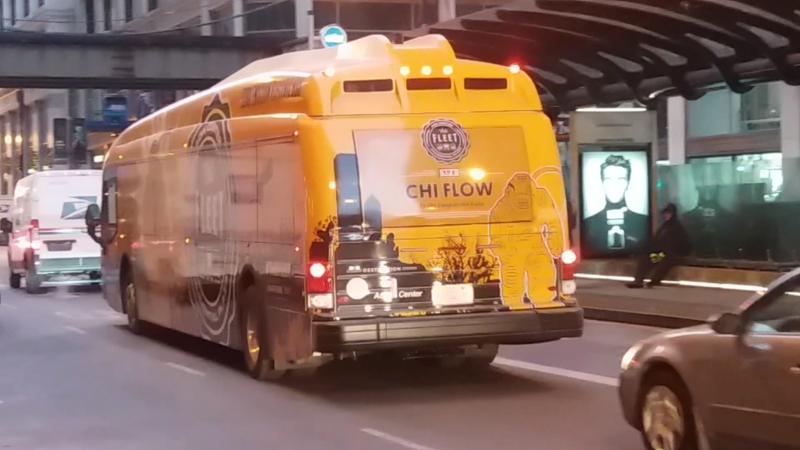 They have no fleet numbers on the buses unless you look at license plates, there's no way to differentiate between them. But they seem to have all different color wraps. Blue, black, pink, purple, yellow, two orange ones, a green one. I couldn't tell if maybe they had two of each color wrap but they might. I took some pics I'll upload tonight. All the destination signs were blank. Dang it!! ? Lesson #1: Never stick a dinosaur's tail in a light socket. The phone number appears to be for The Telos Group LLC, which is the leasing agent for the two buildings, so no hint on who is operating the bus (unless the management company is also into hiring bus drivers). 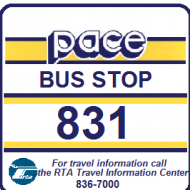 The first picture, when zoomed in, the white sticker below the phone number shows USDOT 665732. Which is for SP+ Transportation, the same company that owns Standard Parking. 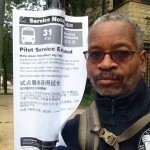 Their website (www.spplus.com) shows Shuttle Driver openings in Chicago. Looks like Free Enterprise lost this contract. Good eye (or better knowledge what the sticker means). The sticker has an SP+ logo, and if I had looked closer at the phone number, I would have seen "telos." At least the headquarters are another client (200 E. Randolph), and I guess this eliminates the question about where they can stash and recharge the buses. That explains why I didn't see any Proterra buses at the lot on Throop when I went searching for those buses. Free Enterprise still had the coaches and the transits that run the Northwestern shuttles. 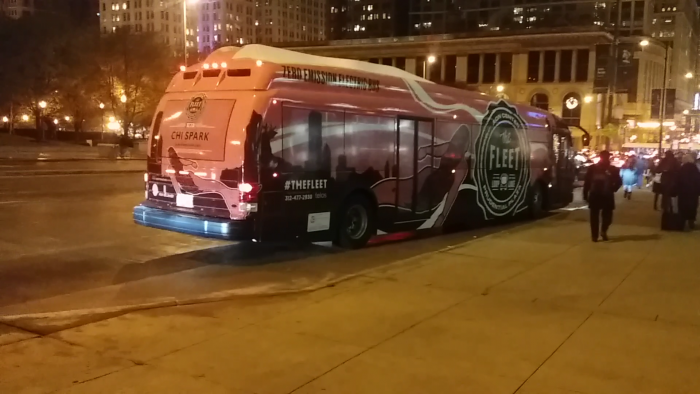 Looks like each one is a different livery, has a different name on the front and Back and does have a number on the back under "The Fleet" emblem. 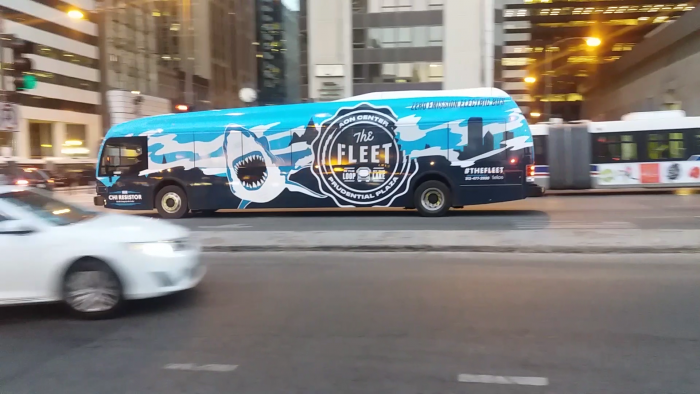 From the tribune article "Each of the 10 new buses will be a different color and feature a different sea creature, including a mint green bus sporting a black octopus with tentacles twisting around Chicago skyline skyscrapers. 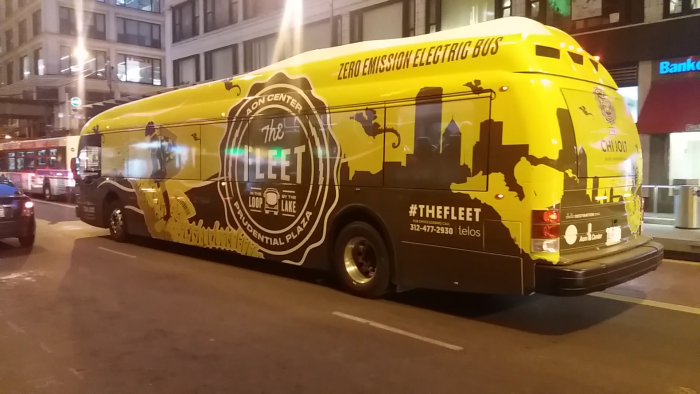 The nautical theme is a play on the "fleet" of buses." 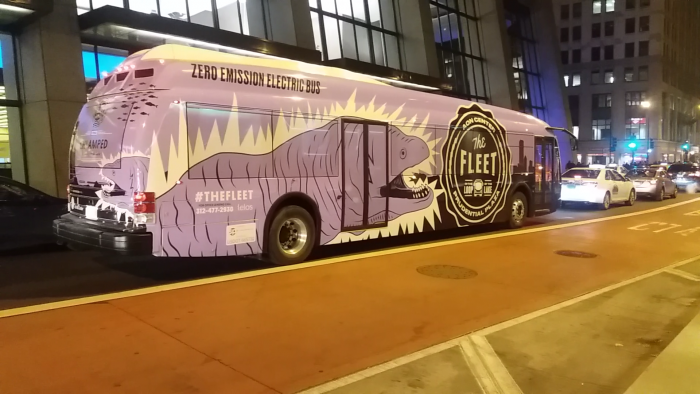 Wow i didn't even pick that up that each bus has a different theme but yeah the purple one has some sort of lizard like creature on it. Hence the busjack reference which completely went over my head!! Maybe it's an eel. 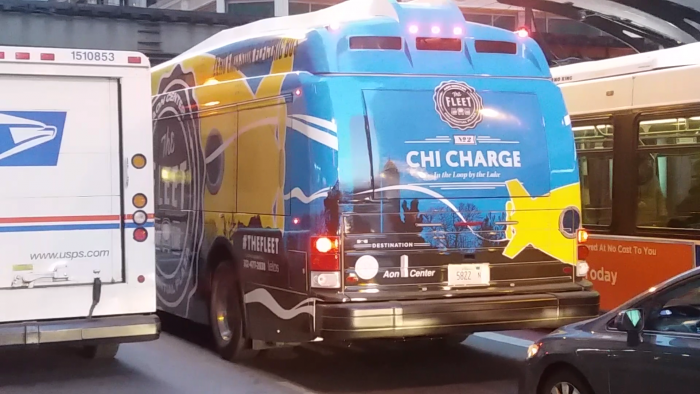 That's the Chi Amped bus. Not seeing where your seeing the number. Wait a minute let me zoom this up. Chi Spark looks like it has a mermaid on it. the purple one has some sort of lizard like creature on it. Hence the busjack reference which completely went over my head!! Maybe it's an eel. Not a dinosaur (I thought it was a reference to lakefront attractions), but maybe a manatee with something stuck in the lamp socket. The number is on the back. I have put a red box round it's location on the attached picture. Yeah I know that's where you said it is I just can't zoom into it to see it. Looks like another exploratory trip is in order. Ok down here in Proterraville again. Already got some good pics. Wth one of the buses says 22 under the rear fleet emblem. There's only 10 buses. I'm really confused now!! i guess you can start singing "we all live in a yellow submarine' cause that's what this looks like. unfortunately no autographs on board from Paul McCartney. Hands down my favorite Proterra, with a shark on there. Try not to get bit!! 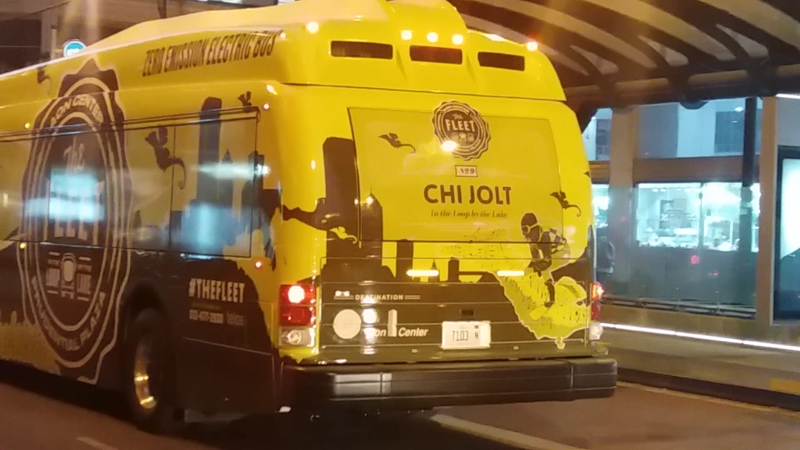 says the number is N29; I was trippin at Union station because this same bus looks green over there and here it's yellow. Too much bushunting for me I guess or a color changing wrap. 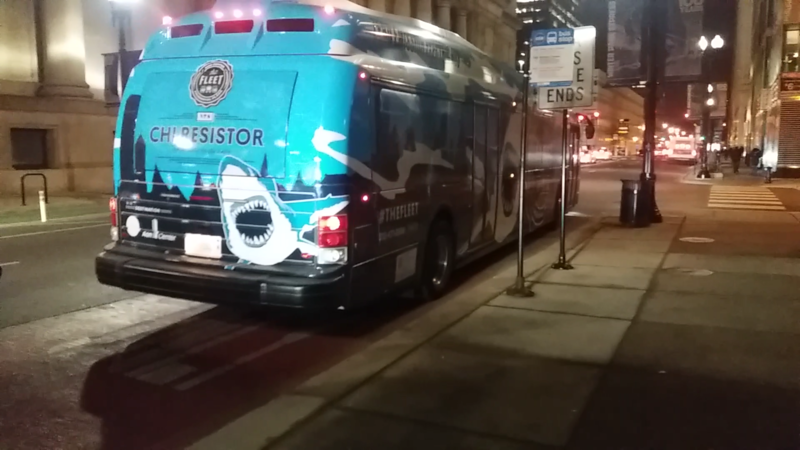 then i got a shot of this octopus bus, but i don't what it's called or it's number but you get to see the octopus anyway. 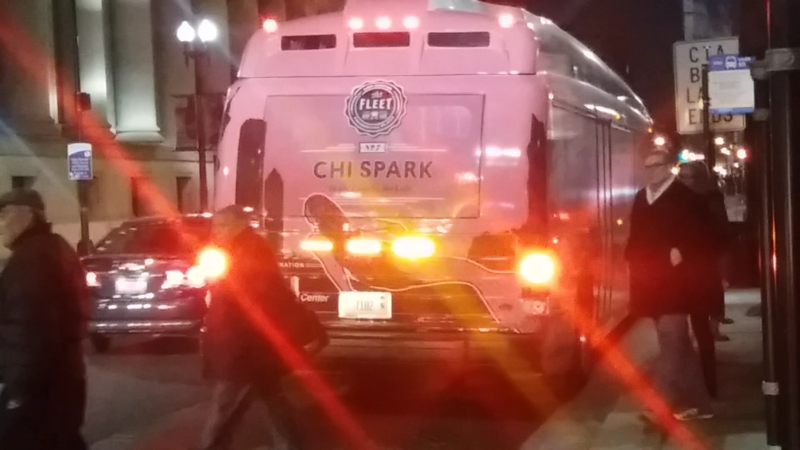 While not the best pic of the Chi Spark it does say it's bus N27. Interesting though. 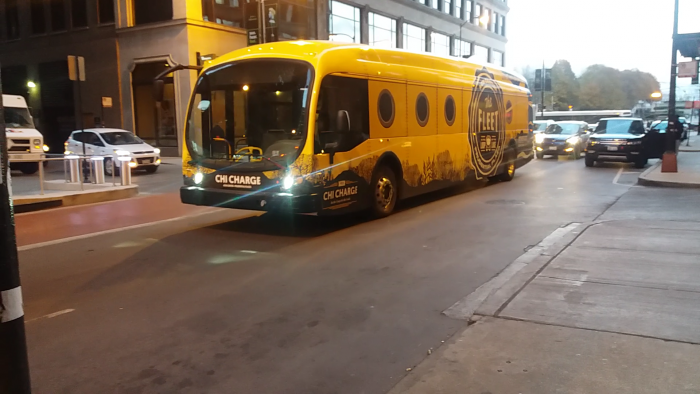 Now can i pick up my paycheck for all these free promotionals of Aon and the proterra buses. It was cold out there too. No I'm not crazy, I'm a bus enthusiast!! They show more of the Proterra buses on the official press link from JLL. 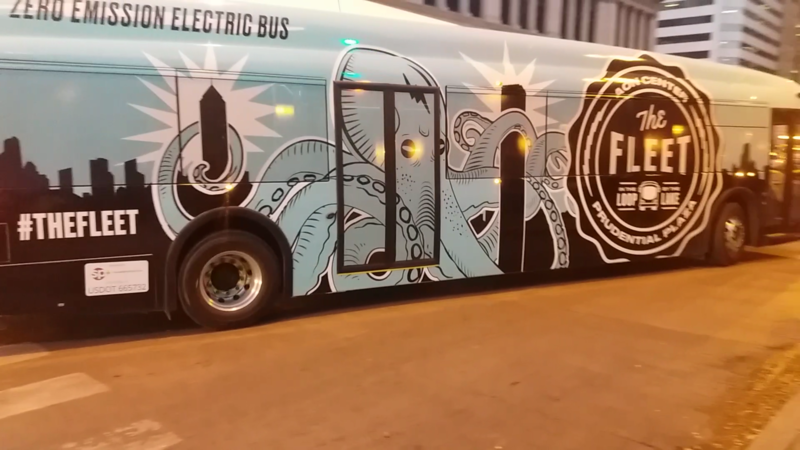 Turns out the octopus bus was in the press conference. Something happened to the link, but if you click on Americas you can get the story. Great pictures. After zooming in on the tiny number box, I think it actually says No. 4 (with the o underlined) rather than N24. Its so small you need a magnifying glass to see it. How do they expect anyone to see it? I'll have to check that out though. I was having trouble myself seeing it in person at night and my vision is good. Yeah your right it is NO son of a gun!! I guess the night was playing tricks on me!! No, it's No. 2, sort of like what's on the trolley replicas in Schaumburg. Just realized the number and name is also under the drivers window. The Octopus is Chi Relay but I cannot see what the number is. The only one not identified is 10. There is a green bus with an arm coming out of the water with a trident as in TC Metro's image on the first page and I saw No. 3 but was dashing for my train and did not notice what the color or design was. The only ones not identified are 5 and 10. There is a green bus with an arm coming out of the water with a tri-spear as in TC Metro's image on the first page and I saw No. 3 but was dashing for my train and did not notice what the color or design was. There is a black one its in one of my pictures. I never have seen the green one. If I dont get snowed in on monday or Tuesday maybe I can go look for it. 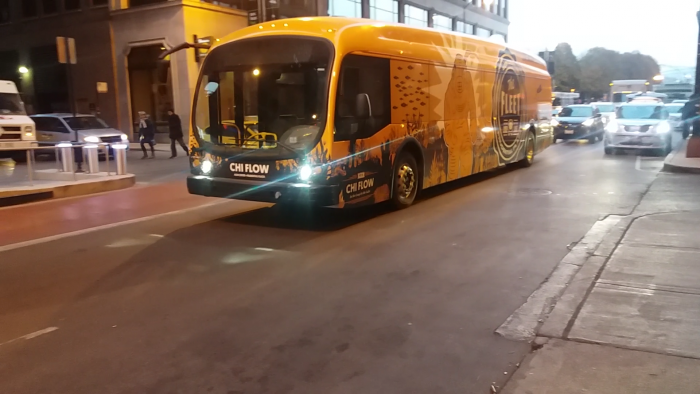 Are the buses heading east on Cermak after 3:30pm and then northbound on Michigan? I saw one Wednesday from the Cermak/McCormick station as the train I rode approached. 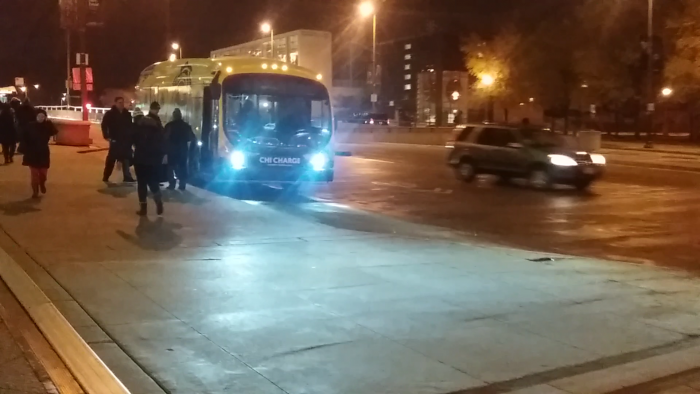 By the time I got to Cermak and Michigan [to get a southbound #3] the Protera was nowhere in sight. That is the Free Enterprise bus park. The Electric buses are operated by SP Transportation (same lot as Standard Parking). I do not think we know where they are based? I don't know, but if I were putting money, it would be somewhere in the bowels of Millennium Garage, especially since the only maintenance facility needed are some chargers.